Spencer's attention for detials is evident in the innovated patient restraint system. 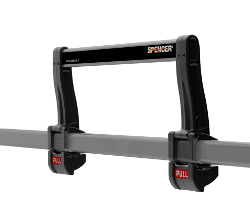 The new Safebar makes the operator's job easier, increases space for the patient (particularly important with the obese or pregnant) while at the same time taking both comfort and safety of the patient to even higher level. +27% space capacity. Functioning time reduced more than 4 times. 60% increase in reflective surface and consequently visibility. Noise during transport reduced 22%. Safebar's numbers speak for itself – innovation is possible only for those who constantly invest in research. Safebar is equipped with automatic opening. 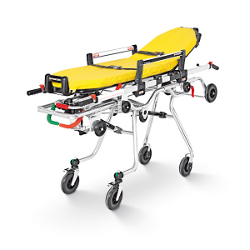 The mechanism can be actioned only from the external side of the stretcher and the patient cannot neither accidentally or intentionally unblock the system. Safebar one can be actioned with just one hand and is ideal for frenzied or confined scenarios. Safebar duo is actioned by two hands for maximum safety. Fewer components together with precision assembly contribute to make a higher quality product where the total weight and kinetic vibration is notably reduced. A space has been considered for graphic or logo personalisation and the use of highly reflective material generally increased the visibility of the whole stretcher in critical conditions. The new standard of safety. Soon a standard feature on the complete Spencer range.